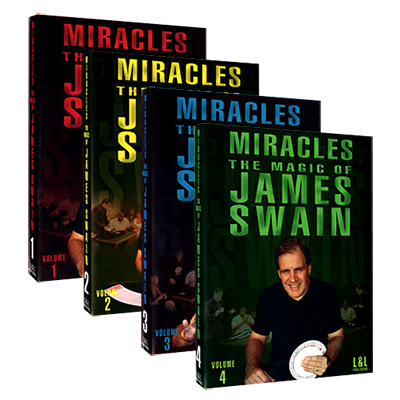 For years, Jim Swain's name has been associated with some of the finest cheating material and classical magic in the industry. He doesn't do conventions, and he rarely surfaces on the scene. Yet he did, for one historic weekend, record all his finest material in four volumes that are now available for instant download. When we look over this material, one word comes to mind: DENSE. This collection is absolutely PACKED with magic and gambling material. Jim studied with all the greats, particularly Jennings and Skinner, and this classical, technical approach is evident in all his work. This is the PERFECT set to be converted to download, as you will want to have computer access to all parts of this footage quickly, and on the go. A standout in the series is Volume 1, which has a description of Jim's entire Gambling Act. This is the act he does to string together some of his best card material. Everything flows, and the act, as a whole, is just a joy to watch. We see lots of good card tricks these days, but it's rare to find someone who has put together the routines in a logical, cool way. And here it is, all explained in perfect detail. Here is the complete list of what's included.